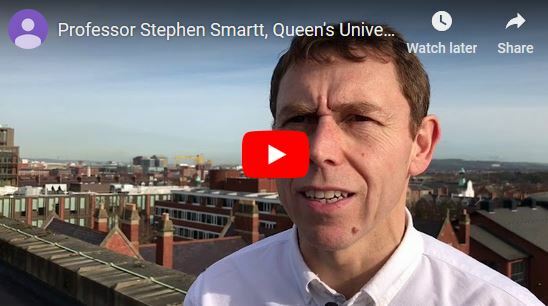 Queen’s University astrophysics expert, Professor Stephen Smartt, has been awarded a prestigious Gold Medal by the Royal Irish Academy. The Academy, which was founded in 1785 and is an all-island independent forum of peer-elected experts in the sciences and humanities, awards two Gold Medals every year to individuals who have made a demonstrable and internationally recognised outstanding scholarly contribution in their field. Professor Smartt, a Professor in the Astrophysics Research Centre in the School of Mathematics and Physics at Queen’s has been awarded the 2018 Gold Medal in Physical and Mathematical Sciences due to his outstanding influence in this area. The Gold Medal in the Physical and Mathematical Sciences is awarded every four years. Speaking about his award, Professor Smartt said: “It is an honour to receive this award from the Academy. As well as a personal honour it’s recognition of the very talented and bright students and postdoctoral scientists that have helped to build my team at Queen’s and make it scientifically respected around the world. Professor Smartt is a global leader in astronomy in the field of sky surveys and astrophysical transients. He has led innovative international projects that survey the sky to find supernovae and exploding stars. Using the Hubble Space Telescope he has directly identified which stars explode as supernovae making a series of discoveries that has advanced the understanding of what causes these flashes of light across the Universe. He discovered many of the most powerful of these explosions, called ‘super-luminous’ supernovae and with his team proposed that the theory of magnetic neutron stars causes their extreme brightness. In 2017, he led one of the international teams to pinpoint the source of gravitational waves, showing that merging neutron stars can produce a brief but luminous explosion powered by radioactivity of the heavy elements. The Gold Medals aim to identify and recognise inspirational figures in order to celebrate the achievements of higher education in Ireland and to inspire future generations. In doing so, the Gold Medals have become recognised as a truly national expression of celebration for scholarly achievement in Ireland.